These headlines can only mean the RHI inquiry is still doing plenty of front page business for our local newspapers. And, no wonder, with former DUP minister Jonathan Bell set to take the stand at the public inquiry following the release of his witness statement on Wednesday. It's the contents of the statement that takes up oodles of space in the Irish News, News Letter and Belfast Telegraph on Thursday. On the Irish News' front page, it reports that the former minister will tell the inquiry that DUP leader Arlene Foster vetoed efforts to end the flawed green energy scheme. "His (Mr Bell's) witness statement, released last night ahead of today's appearance at the inquiry, includes allegations that Mrs Foster disregarded the advice of senior civil servants and insisted that the scheme be kept open," it reports. 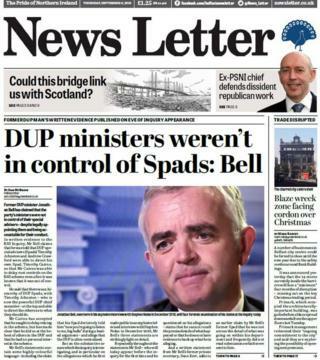 The News Letter's front page takes a slightly different approach and instead focuses on claims by Mr Bell that DUP ministers were not in control of party special advisers (spads). The paper adds that "on the substantive issues which the inquiry is investigating", Mr Bell's three statements are "strikingly light on detail". The Belfast Telegraph's front page continues a theme from Wednesday and looks at apparent dysfunction in the DUP. "Distrust and toxic relationships at the heart of the RHI crisis" is the front page headline with the newspaper reporting claims by Mr Bell that his spad, Timothy Cairns, launched a "crude outburst" in which he told him: "Now you're going to listen to me big balls." Stay tuned for Mr Bell's evidence in front of the inquiry later on Thursday - looks set to be a good one. 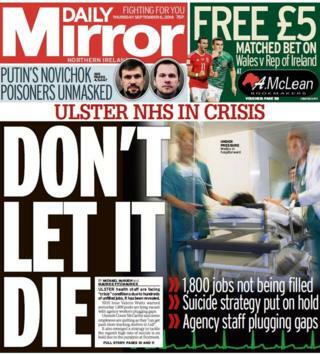 Elsewhere, the Daily Mirror's front page turns instead to what it describes as the "Ulster NHS in crisis". "Don't let it die" is the headline, as it reports that health staff are facing "crisis conditions" because of up to 1,800 empty jobs left unfilled. It also reports that a strategy to tackle Northern Ireland's high rate of suicide is on hold due to the stalemate at Stormont. The newspaper continues the story with two pages inside highlighting the "critical condition" of Northern Ireland's health services. Meanwhile, a Celtic fan from Northern Ireland has been blinded in one eye following an "unprovoked, savage attack" after last weekend's Old Firm game in Glasgow, the Irish News reports. It says that Charlie Phelan, a 48-year-old from Londonderry, suffered a broken eye socket, cheekbone and nose when he was beaten unconscious with what he believes was a knuckleduster. He believes he was targeted because he was wearing a Celtic top. Back in the Daily Mirror, the paper reports of a "bowel cancer breakthrough" by scientists at Queen's University in Belfast. It reports that researchers have come up with a "groundbreaking therapeutic process that can target and kill bowel cancer cells" and that it could "improve survival rates for bowel cancer patients globally". An academic is also making a splash in the News Letter as he refloats the idea of a bridge from Northern Ireland to Scotland. Under the headline "Treat Scottish bridge idea seriously", the News Letter reports that Prof Alan Dunlop, a leading architect, believes the UK, Irish and Scottish governments should conduct a feasibility study into the idea. Image caption Could a bridge still happen between Scotland and Northern Ireland? He also shared an image of what a potential bridge could look like ahead of giving a keynote address at an architectural conference in Scotland. While admitting that the bridge could cost upwards of £15bn, Prof Dunlop told the newspaper that the project "would be a transformative economic generator and a world first". And finally, who'd live in a house that's the width of a typical parking space? That's the question being posed in the Belfast Telegraph, which reports that a 2.5m wide house in Portrush has gone up for sale for £180,000. The house, which the newspaper says is believed to be the site of an old alleyway, has been converted into a "stunning seaside three-bedroom townhouse". As the paper suggests in its headline - the narrow-minded need not apply.